Bucket - this is used to store used cloth nappies until wash day, to make it easier put a mesh inside the bucket and then just left out the mesh and put it in the machine so you don't need to touch the soiled nappies. I find that a bucket is easy to clean in between uses. Boingo - used to fasten terry nappies, prefolds and fitted nappies that don't have a fastening like sloomb multifits or minis. Use one of a small baby or 2 on a toddler. Cover - a cover is used over a prefold, fitted, terry or insert, it provides waterproof barrier they are made of pul, wool or fleece. Covers are also known as shells or wraps. 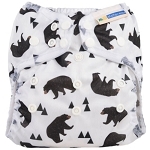 Duo sizing - some nappies and wraps have duo sizing with size 1 giving a got fit on newborn babies and then size 2 covers until potty training, well known brand with duo sizing is thirsties although their pocket nappies and all in ones are now one size nappies. Dry pail - term used for storing nappies in a dry bucket, nappies are no longer soaked - like I did with terries 18 years ago. Soaking nappies that have elastic and pul can be damaged by soaking. Explosion - also known as poo explosion, newborn babies especially breastfed babies do very liquid poo's which can get everywhere up their backs and down their legs. Fastening - the way that nappies fasten such as snaps (poppers), velcro - hook and loop, nappi nappa, boingo or pins. Flat - a term used for all flat nappies such as prefolds and terry squares. 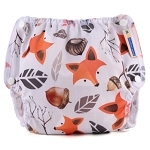 Fitted - a fitted nappy is a shaped nappy that is fully absorbant ideal for heavy wetters and night times. fleece - Fleece is a fabric that is used for fleece liners to provide a stay dry affect to any nappy, fleece is also used to make wraps. 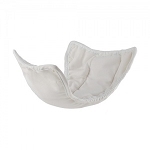 Insert - inserts are used inside pocket nappies and all in two nappies for the nappies absorbancy. Inserts are also used to increase absorbancy for heavy wetters and overnight. They can be made of hemp, bamboo, microfibre or a combination, disposable inserts are also available from flip and are ideal for days out and holidays. Mesh - a mesh bag can be put inside a nappy bucket so come wash day it can be lifted out and placed straight into the machine without touching the nappies again. one size - nappies and wraps are available in one size also known as birth to potty nappies they are designed to fit from 6-10lbs in weight until potty training. Prefold - this type of nappy is a flat rectangular piece of fabric made from layers of cotton, hemp or bamboo, usually there are more layers in the middle they are available in newborn, small, medium and large. They can be folded into a pad and placed in a wrap or folded and fastened with pins or nappi nippa making it more like a fitted nappy so better for containment. These are economical and are ideal for newborn babies that get through a lot of changes in the early weeks.